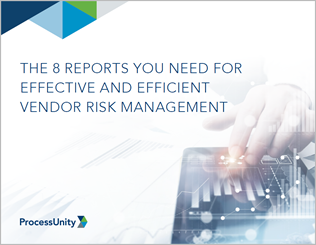 Download ProcessUnity’s latest eBook The 8 Reports You Need for Effective and Efficient Vendor Risk Management and see how one-click access to the right information is critical for an effective and efficient program. The foundation for a successful vendor risk program is solid reporting. The right reports save your team time, help you prioritize and show management and regulators that risk is under control. Take the first steps towards improving your reporting capabilities. Complete the form on the right to get your copy of 8 Reports now.